A top collegiate quarterback at St. Bonaventure (where he set conference records on offense and passing) and the University of Detroit (where he led the nation with 1,813 yards in total offense in 1952), he went on to play four years with the Pittsburgh Steelers and Chicago Cardinals in the National Football League before an arm injury ended his career in 1957. He has been in pro coaching since 1961: as an assistant with Washington, Los Angeles Rams, Chicago, Detroit, Philadelphia and Buffalo, and as head coach of the Baltimore Colts (1975-79, including three consecutive AFC East championships), Indianapolis Colts (1992-1995) and, since 1996, the Baltimore Ravens. Born on March 15, 1931 in Franklin, Pennsylvania, Ted Marchibroda was the youngest child of Polish immigrants. This son of immigrants went on to star as a quarterback on both the collegiate and professional levels. During his college career, he was considered the finest passing quarterback in the country. Marchibroda starred at St. Bonaventure University until 1951 when the Bonnies dropped football. He transferred to the University of Detroit where he completed his outstanding career. While a sophomore at St. Bonaventure, Ted set Eastern Intercollegiate Football records in total offense and passing yardage. In 1950, he gained a total of 1,693 yards – 1,577 of them through the air. At the University of Detroit, he continued adding to his fame. In 1952, he led the nation in total offense with 1, 813 yards and ranked ninth nationally in passing yardage with 1,637. Marchibroda also set a national single game passing mark. In a Missouri Valley Conference contest with Tulsa, he unleashed a dynamic air offensive, hitting on 27 of 54 passes for 390 yards. 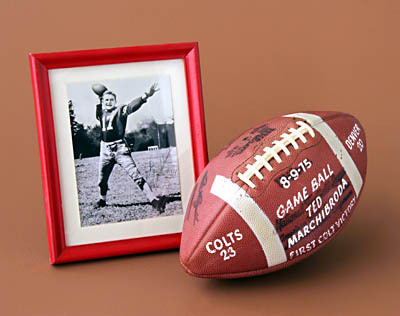 Marchibroda was a first-round draft choice of the Pittsburgh Steelers in 1953. His rookie season was interrupted for military service and he returned to the Steelers in 1955. Ted was the league’s second leading passer on 124 of 275 pass attempts for 1,585 yards and 12 touchdowns in 1956. Ted’s pro career ended in 1957. He had been traded to the Chicago Cardinals and suffered a career ending arm injury. Following a brief career in private business, he began his pro coaching career with Washington in 1961. In 1966, he joined George Allen’s staff in Los Angeles. Marchibroda was named head coach of the Baltimore Colts on January 15, 1975, after spending nine years as an assistant to Allen with the Rams and then the Redskins. In his first year with the Colts, Ted led the team to one of the greatest franchise turnarounds in league history. In 1974, Baltimore had finished 2-12. Under Marchibroda in 1975, the Colts finished 10-4 and captured the AFC Eastern Division Championship. As a result of this turnaround, he was the near-unanimous choice as the coach of the Year in the NFL. In 1976, the Colts finished 11-3 and in 1977 they had another 10-4 season. Ted would coach the Colts for two more seasons until leaving the team in 1979. However, his history with both the Colts, and the city of Baltimore, would be rekindled in the 1990′s. In 1992, Marchibroda was named the head coach of the Colts again – this time, though, with the Indianapolis version. He guided the team for four seasons, leading his team to two playoff victories in 1995 before losing in the AFC championship game. For the 1996 season, Ted found himself back in Baltimore as head coach of the new Ravens franchise, formerly the Cleveland Browns. He coached the Ravens through the 1998 season.